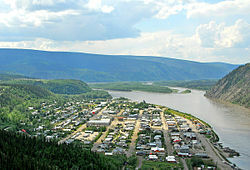 Dawson City is located in the Yukon of Canada. Dawson City is accessible by the Top of the World Highway (if you are traveling east out of Alaska) or via the Klondike Highway (if you are traveling north). Dawson City also has a small airport for chartered flights. Air North also has service from Whitehorse to Dawson City. 64.0422-139.131 Dawson City Airport (YDA IATA). Husky Bus offers seasonal bus service from Whitehorse, May–September. Historic Klondike Gold Rush Town. 64.0615-139.43021 Diamond Tooth Gertie's Gambling Hall. a touristy relic of the old Gold Rush days but it is still a blast, frequented by locals and visitors alike. $10 gets you in the door any day of the week, and in the summer at least there are three can-can shows a night in addition to gambling of all sorts, food, and of course local beers and drinks. Paddle Boat Graveyard. Old paddle boats that plied the Yukon are drydocked, after a fashion, down the Yukon River opposite the town. To reach this you must take the free ferry across the river and walk through the government camping area along the river. Where the camping area ends, get out onto the river's shore and walk maybe 1/8 of a mile further. These are dilapidated tetanus traps but it's fascinating to crawl around in and on them. Cemeteries. The towns has a great variety of cemeteries, including Jewish, Masonic, RCMP, and others. They are a reminder of the town's colorful past. They are just a short drive up Crocus Bluff and halfway up the shoulder of the Midnight Dome mountain that looms over the town. Gold Bottom Mine Tours, Front St. beside the Trading Post, ☎ +1 867 993-5023. 9:15,1:30. An experiential tour of an operating placer gold mine in Dawson City Yukon. See placer mining up close and personal, learn some Klondike 98 mining history and do some creek gold panning, with the opportunity to take home anything you find. $40. The Trading Post, Front Street. has amazing examples of Tr'ondek Hwech'in products. Beaded vests, fur mittens and the like. The shop also has all the things you might need to make a journey out onto the land more civilized. Downtown (The Downtown Hotel). has a good bar, home of the "Sourtoe Cocktail Club." There is also internet access available at the bar. The Pit (Westminster Hotel). For some local colour try the beer parlour at the Westminster Hotel or "the pit" (the dodgy looking pink building on 3rd ave) where gold mining fortunes and welfare cheques alike are cheerfully exchanged for $2 sleeves of draught beer almost any time of any day. Good local live music in the lounge next door at the pit some nights too. 64.06842-139.438831 Dawson City River Hostel, Dieter Reinmuth, ☎ +1 867-993-6823, e-mail: dawsoncityhostel@yahoo.ca. Seasonal monthly tenting available. Bike and canoe rentals and van tours by demand. Owner is author of the "Yukon Travel Adventure Guide" and "The Saga of the Sourtoe" Dorms from $18 (members), $22 (non-members), private rooms $46. Tenting fees are: $14 one person one tent and $9 per person if more than one per tent..
Bombay Peggy's, 2nd Avenue and Princess Street, ☎ +1 867 993-6969. Rooms with en-suite and shared bathrooms. From $85/89 low/high season. This city travel guide to Dawson City is a usable article. It has information on how to get there and on restaurants and hotels. An adventurous person could use this article, but please feel free to improve it by editing the page. This travel guide page was last edited at 06:05, on 14 January 2019 by Wikivoyage user Traveler100bot. Based on work by Wikivoyage users Ibaman, Traveler100, BlueWolverine, DaGizza, Robkelk, Ikan Kekek, Eco84, Mx. Granger and JakeOregon and others.